I think the roadworks a few yards from me are beginning to influence my subconscious. In the next street they are laying gigantic striped-plastic tubes underground. They are big enough for a large man to climb through. At night the place becomes one huge theme park for the millions of London rats who raid our bins. They can now combine an evening's top-class scavenging with a tubular ride. I find myself watching the workmen for long periods of time, mesmerised as they thread these enormous tubes through a hole in the ground. Then I walked to the supermarket.. Wheeling my trolley past the pasta shelves I was drawn towards the cannelloni. And this is the end result - Butternut Squash and Puy Lentil Cannelloni. If there are any leftovers, and I suspect there won't be, I will deprive the rats and take it over to the workmen in celebration of their tubular engineering. 1. Heat the oil, and soften the finely chopped onion and crushed garlic for 5 minutes with the smoked paprika, cinnamon and mixed herbs , stirring all the time. 2. Add the small-cubed butternut squash and stir occasionally for 8 minutes on a medium heat, making sure it doesn't stick. they should soften and be well coated with the onion spice mixture. 3. Add the vegetable stock and lentils and bring to the boil. Then turn down the heat and allow to simmer on a low heat with the lid on for 15 minutes. 4. Stir in the tomato paste and tinned chopped tomatoes over a medium heat for a further four minutes. Season with salt and pepper. 5. Stuff the cannelloni tunbes with the butternut squash mixture - using a teaspoon to make sure they are properly filled.Lay them out cheek by jowl in a rectangular oven dish. Pour over the leftover butternut squash mixture evenly. 2. Stir in the flour and keep stirring until it forms a smooth paste. 3. Add the milk and whisk constantly till the sauce thickens. 5. Add the grated cheddar cheese and stir in on a low heat until it is smooth and melted. If you have any lumps you can always push the sauce through a sieve. 6. 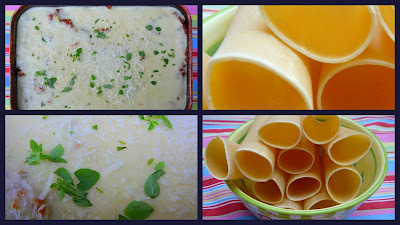 Pour the cheese sauce evenly over the butternut squash canneloni, sprinkle over the finely grated parmeggiano cheese and finely chopped basil leaves. Cook in the preheated oven for 25-30 minutes at 180C. I had a lovely email from another blogger - Jennifer Johnson in the USA who works with student nurses. I was intrigued by her top tips for making a drive-thru meal more healthy - and because i am a great believer in changing eating habits by altering the everyday things we do - here they are. If any of you have anything you want to share with me - please do let me know! I have never tried butternut squash. I like this idea. Maybe I will give this challenge a try. wonderful,its look likes very delicious.yummy,thanks. Butternut squash is one of my favorites, your idea is genius! Can't wait to try it. This sounds delicious and so seasonal right now with all the squash "love". I seem to eat butternut squash at least once or twice a week. This looks like a good idea. May have to try it out soon. What a facinating article. I’m looking for a marketing expert to help with a project, could you help? Please come visit my site Chicago Business Services And Classifieds when you got time. Does somebody tried this already? I am pretty curious about this one... Yeah it looks like its tasty hmmmm I am already craving for it! This sounds wonderful. I know I'm a few years off here, but good things don't change.